This post was inspired by the Pink and Green Mama. 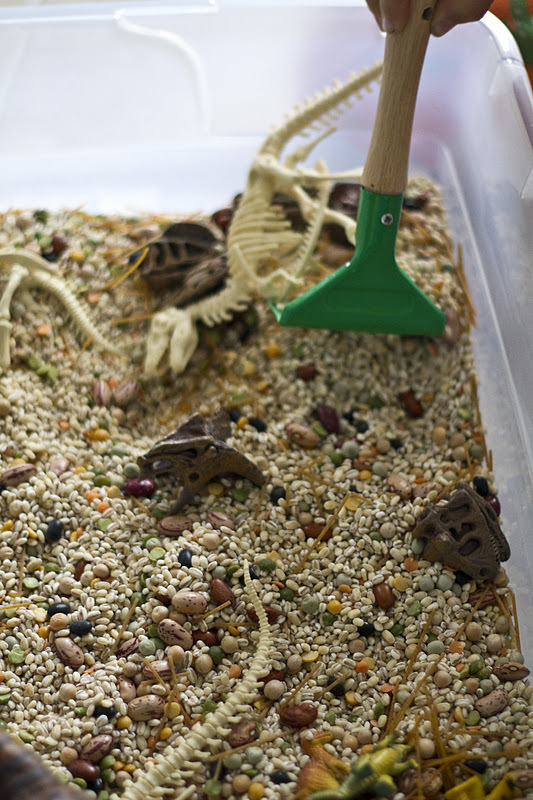 I was reading her blog and stumbled on her halloween sensory bin. 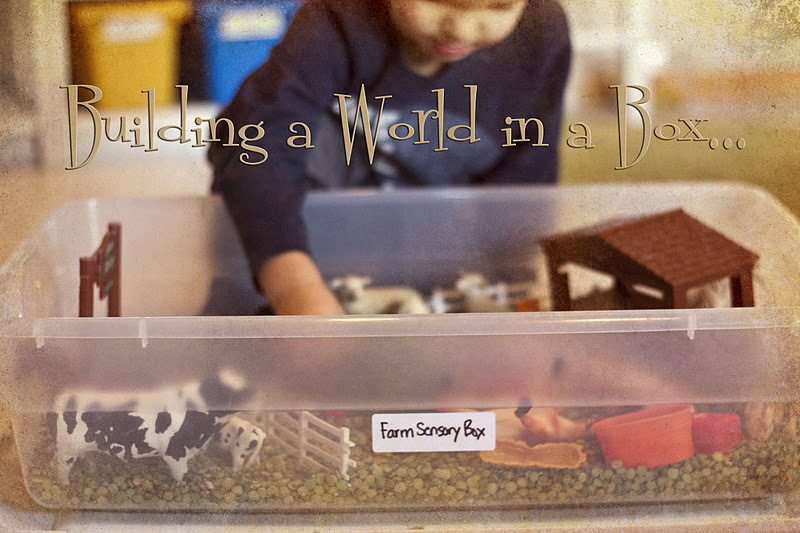 Suddenly I was filled with ideas and couldn’t wait to get building little worlds in a box for my own little ones to discover. My kids and I spent the weekend hunting and gathering, scavenging, and searching for things we could put in our little bins. The following photos and ideas are the culmination of many minds…my own 6 kids, myself, and a remarkable woman who calls herself the Pink and Green Mama. 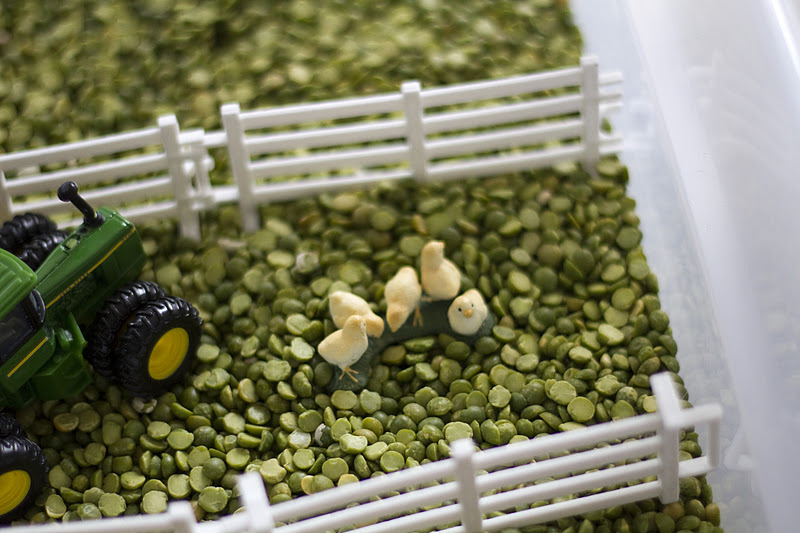 We chose split peas for the substrate and then filled it in with all kinds of plastic farm animals. And what farm is complete without tractors? A trip to Peavey Mart had us all stocked up in al colours and styles. We even found a little plough attachment. We added a little stable, some fences, wheel barrows, buckets, hay bales, plastic veggies, and animal brushes. Don’t worry if all your pieces are not to scale. This is not a science of exactness, it is a science of discovery and imagination! The substrate is barley, a few split peas, and a bag of mixed beans. 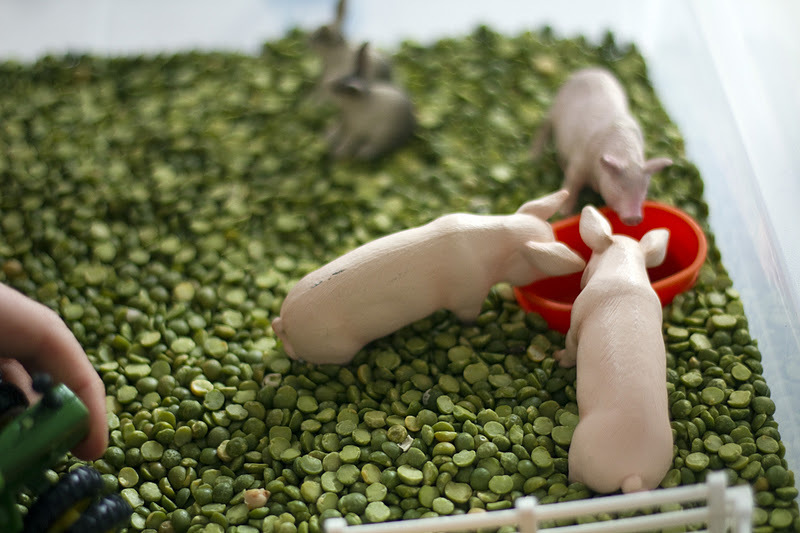 Note that each bin took approximately four 900g bags of substrate. 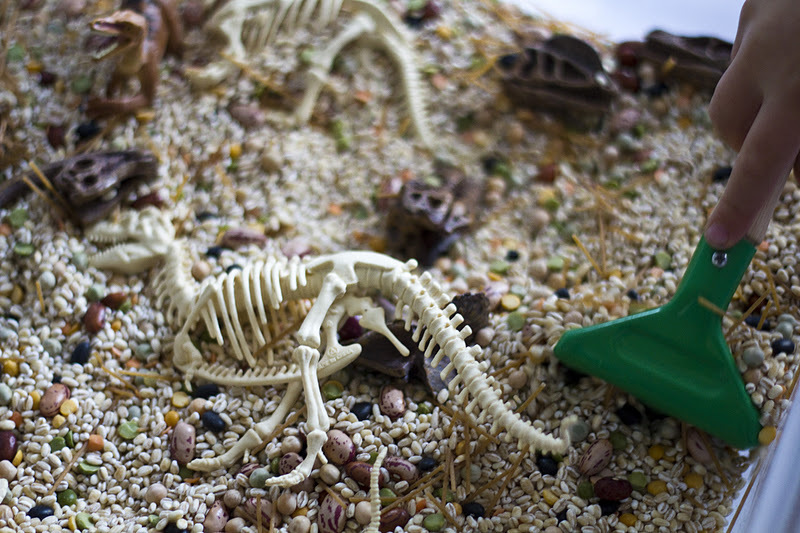 Oh, and my 10yr old son added broken pieces of dried wholewheat spaghetti so he could make “nests” for the dinosaur eggs. Most of them were purchased at WalMart for less than $2 a bag. 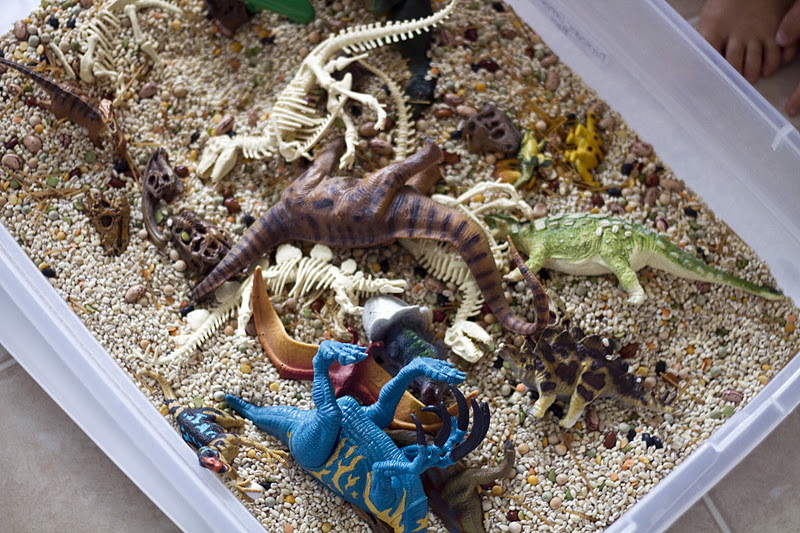 We added a few “live” dinosaurs to further extend the play possibilities of this bin. The boys especially love the “carnage” this box lends itself to! Hehehehehe! The beans become the eggs and then the egg stealers steal the eggs, and then the cranky mumma comes along…and well…this is NOT a quiet world in a box! That’s for sure! This one was very simple and quick. We used four bags of black beans, 2 bags of glow in the dark stars from the dollar store, a couple bags of sparkly pompoms for “meteors”, a tube of plastic planets from ToysR’Us, and a yellow bouncy ball for the sun. 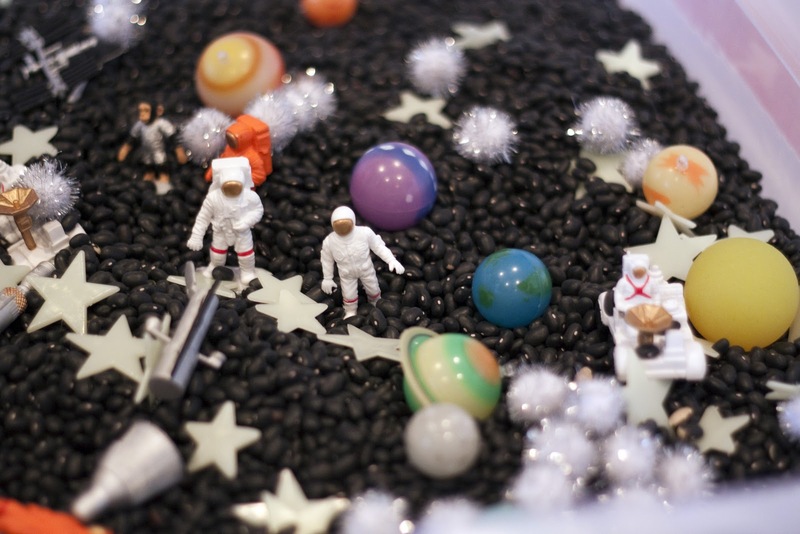 Then we added a tube of astronauts and satellites, rockets, moon buggies, and space shuttles. 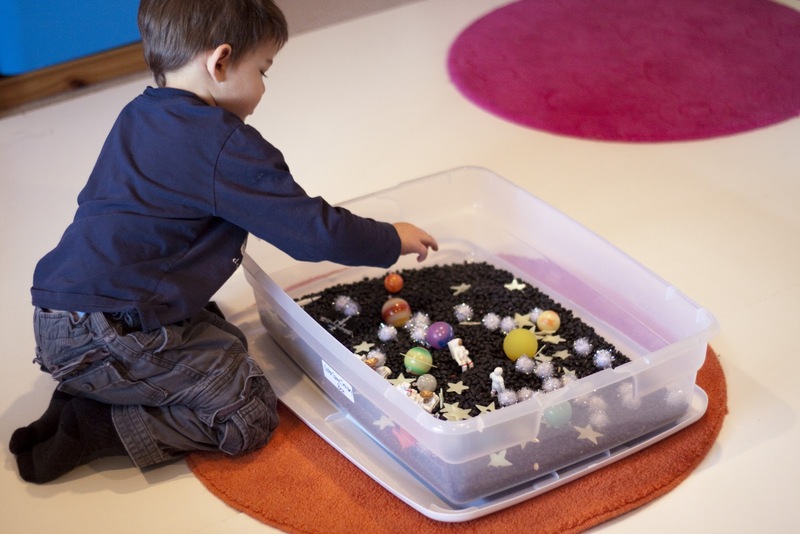 This is a great bin for learning your planets! And the best part is, the stars glow in the dark, so it’s even fun with the lights off! The substrate is 3 bags of aquarium gravel. 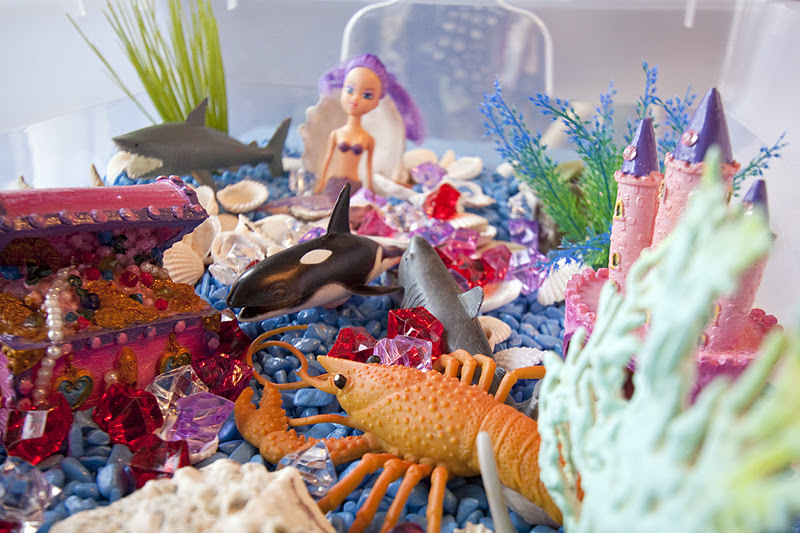 Then we added a bag of plastic jewels, which we found in the fish section of the pet store. 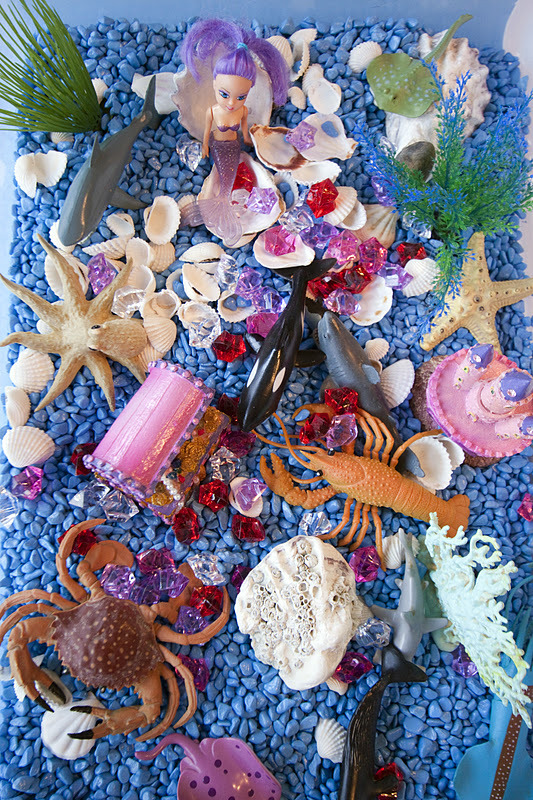 We also added 2 bags of store bought seashells…99cents/bag at Pet Smart. I also had some real oyster shells that I had collected on the beach in the spring so I put them in the box. My 6yr old daughter immediately fashioned an oyster shell chair for her mermaid. 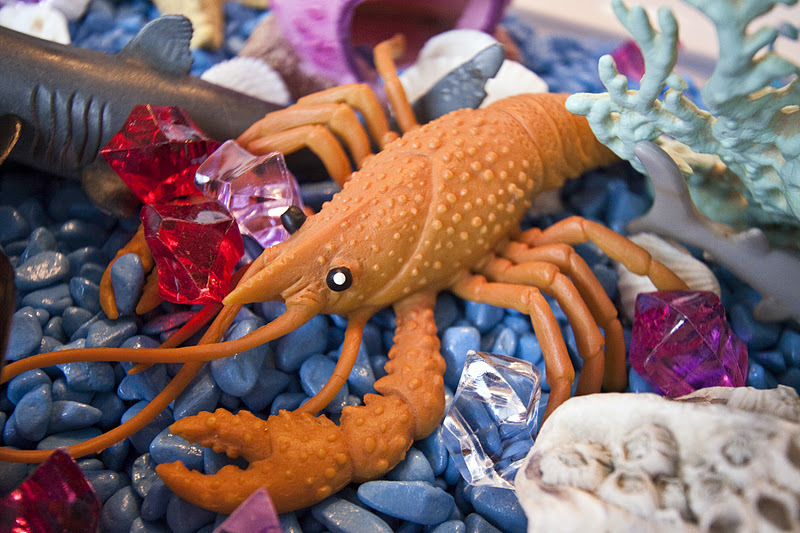 You can fill your under water kingdom with all sorts of plastic ocean creatures. We also put little 99cent aquarium plants in ours to make more places for little sea animals to hide. 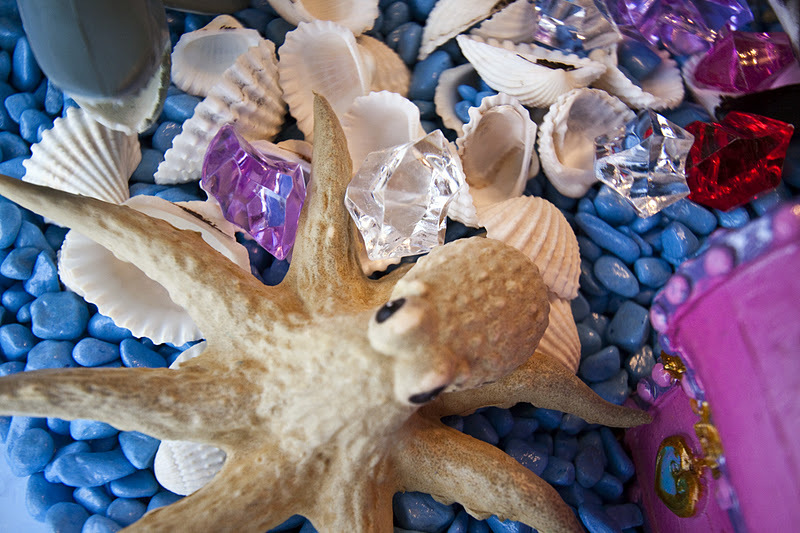 The underwater kingdom has so many possibilities, and hours of imaginative play awaits! Our final box was built entirely by my ten year old son. 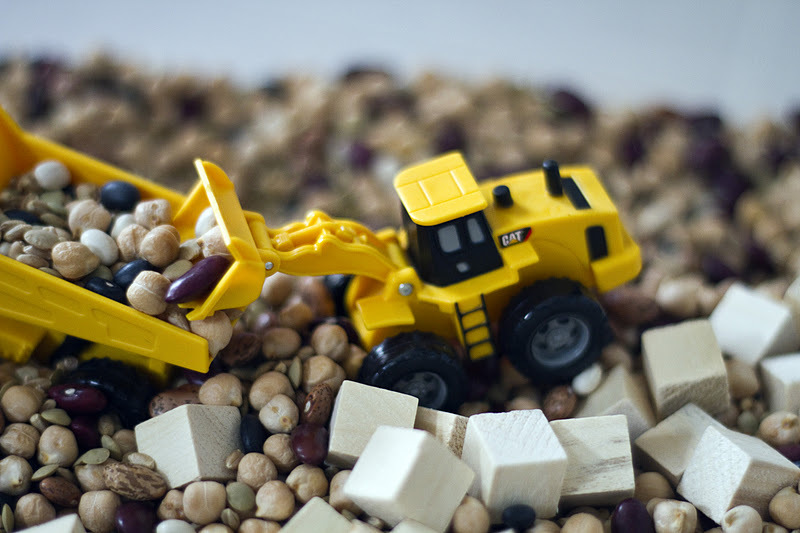 He chose dried chick peas, green lentils, wheat, and a bag of mixed beans for the substrate. 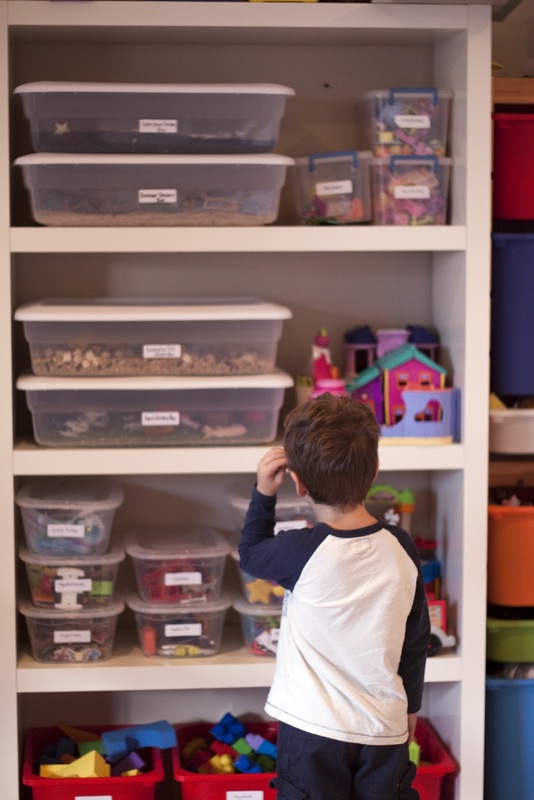 He added a bag of shiny brown rocks from the aquarium section of the pet store, and 2 bags of wooden blocks from the craft section of the dollar store. 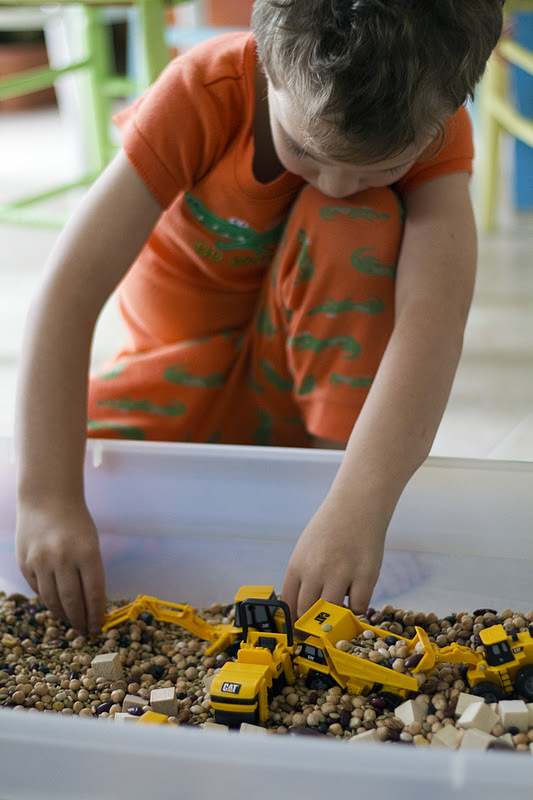 We bought an $8 set of mini CAT machines at ToysR’Us and the hauling and scraping, filling and dumping began! My 5 year old son plays with this one for hours…right from the time he wakes up in the morning! The following Monday, I added our little “worlds in a box” to my dayhome space. The kids played with one after the other, after the other. Please let your imaginations fly when you build your worlds. The sky really is the limit! We are already collecting items for our “Winter in a Box”…the kids can’t wait for this one! And if you build your own boxes that are different than the ones posted here, would you please come on back and tell me about them? I’d sure love to hear your ideas!! Once again you are the incredible mom with AWSOME ideas. The kids are soooo LUCKY that come to your Day Home. Unfortunatly you make the other Day Homes look less appealing. Now if we could clone you! I love your blog and think all your ideas are awesome! 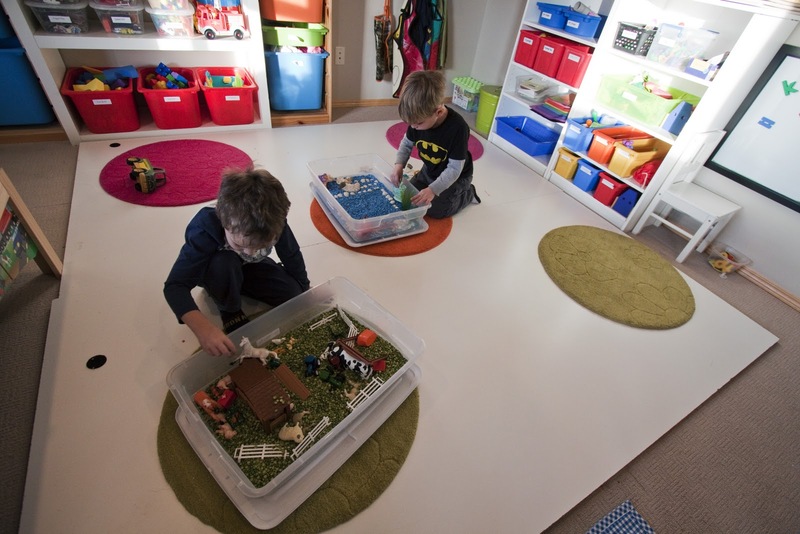 Is there somewhere where I could nominate you for Dayhome Of The Year? Have a wonderful weekend. 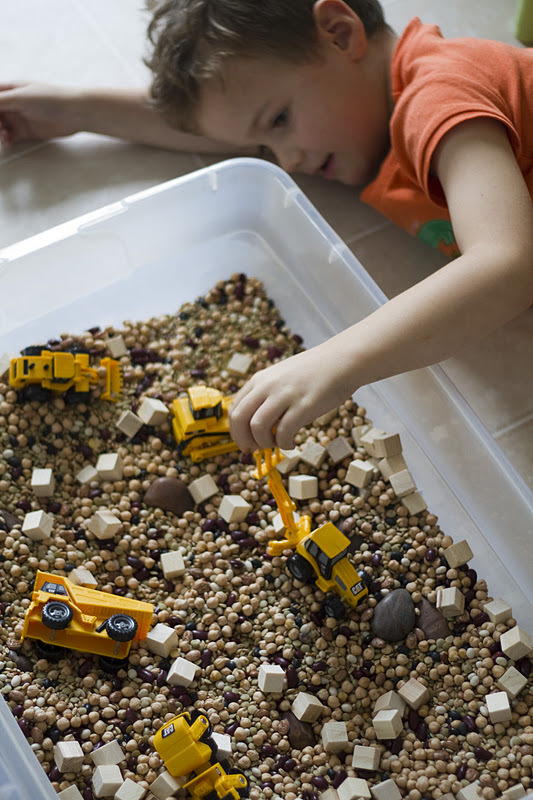 What wonderful sensory play bins! And even more so, I am oooh’ing and ahhh’ing at your playroom. It’s so serene and organized. The kids are so lucky! We have a designated area for the bins…I am always supervising and if I see items leaving the area, then I step in. I do however, allow them to take items in and out within their workspace. I have one who likes to take all the items out (except the substrate) and then place each item in one at a time so it is “just so”! Oh, and I keep a broom close by! What size are the boxes you used? I have been waiting to make these boxes, as I start a Kindy job here in Perth western Australia. I went to a big hardware store and bought from the garden section, little path stones, in various colours. Blue, wheat coloured and green! I purchased a 20 litre/20q container and filled the base with the stones! I love it! Now I am off to get the farm items! I have your button on my small, just starting out blog!! Hi! What fun bins! I especially like the outer space one. Did you get the astronauts at Toys R Us too?? Thanks!! Awww…all the way in Australia! So great! Thanks for your comment, Alison! Enjoy! 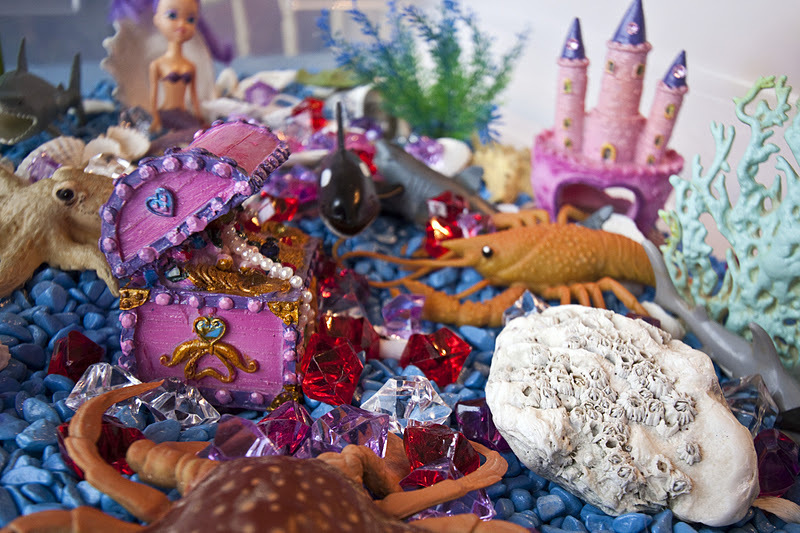 I made a ‘pond’ with pebbles, rocks, foliage and lots of toy amphibians and reptiles. I also filled the box up with a little water. Beside the box I put books for various ages about pond life. The children loved playing and learning at the same time :). I am a childminder and I am always coming back to your website for inspiration! I tried your mini construction site and dinosaur small world, which the children loved and am planning on doing the under water kingdom small world next. Hi, I found you on WordPress. I usually don’t bother to bookmark blogs, but you’re awesome, so I plan on visiting again. Thanks for the great idea. I initially found (and loved) your blog because of the bento boxes when I was packing lunches for my daughters. 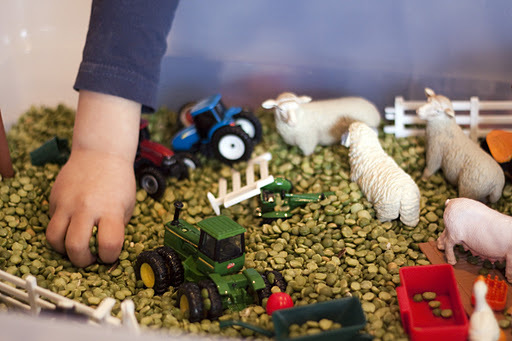 But now 3 years later, I’m a preschool teacher, and I also love your blog for these awesome sensory bins. Thank you for such a wonderful website!